Identification: This is a pale yellow dorid with about seven gills arranged in a semicircle. There is a dorsal flap covering the gill opening. 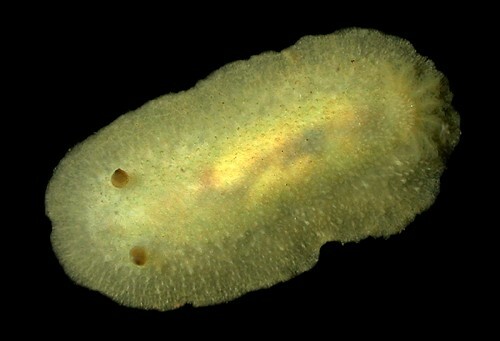 Natural history: Doris granulosa is a common species found under rocks in the low intertidal at protected to moderately exposed rocky sites. Acording to Kay, (1979), it feeds on the blue sponge Suberites aurantiacus (formerly Terpios zetiki). It lays a cream, spiral egg mass that hatches in about six days in the laboratory. Taxonomic notes: This is the species listed as Doriopsis granulosa Pease, 1860 in Kay, 1979 as well as Kay & Young, 1969. It was first reported from Hawaii in Pease, 1860. Photo: CP: 13 mm: Hekili Point, Maui; May 25, 2005.